Home / Longarm Machine Quilting Class / Learn Ruler Quilting on a Home Sewing Machine! In this class we’ll be quilting with basic straight edge rulers. When new quilters ask me what rulers to get, I always suggest they start with a simple ruler that helps them stitch straight lines. Circular, curved, and arced rulers create stunning designs, but you won’t use them on every quilt. A straight edged ruler is so versatile! When you’re confident with rulers you’ll find yourself reaching for that straight ruler all the time! 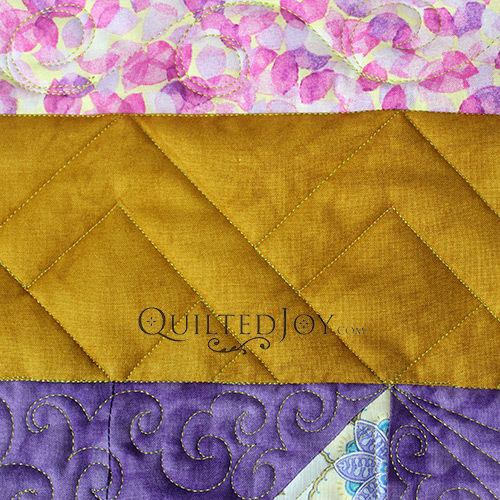 Before we start quilting, we’ll spend a little time talking about the basics of ruler work. We’ll talk about ruler safety and how to keep your machine – and your fingers 🙂 – happy. We’ll also talk about what to look for when you’re shopping for rulers. Not all quilting rulers are made equal and some rulers will work better for you than others. During the hands on portion of the class we’ll tackle stitch in the ditch techniques, border designs with corners, and a few block designs. Students are encouraged to bring their own straight edge rulers to learn with in class. I’ll be teaching the sit down quilting with straight edge rulers on Saturday March 30, 2019. Click here to see the full supply list and to register today. As always, space is limited so please register soon! Looking for a ruler class for stand up longarm quilting? I’m also teaching a straight edge ruler class for stand up longarm quilters in April (this class is almost full!) and a circle ruler class for stand up longarm quilters in June!